Terence Main's work redefines the boundaries between art and design. The biomorphic elements of his works recall the fossilized remains of ancient creatures and vegetation. Overall, they often have the look and feel of natural phenomena rather than crafted objects. Looking outside the boundaries of classicism, Main responds to the rich material of primitive art with furniture that intimates the power of animist belief throughout human culture. One of his sinuous benches suggests a forgotten path or the spine of an extinct animal; the ambiguity of its place in the natural order augmenting the sense of desuetude and revealing the patterns in which this natural order is manifested. Main's work seems to exist within the generative and destructive cycles of nature. Main's work is in the permanent collections of the Metropolitan Museum of Art, Brooklyn Museum of Art and the Cranbrook Academy of Art Museum, among others, and has been featured in numerous publications and exhibitions worldwide, including: Modern Furniture, The Metropolitan Museum; Art and Application, Turbulence, NY. "My objects have always been about redefining the boundaries between art and design. The process is a personal idea history oriented "gut and soul" exploration in a territory that I have created for myself. I've married form and function, fact and fiction and art history with design history. My new objects have evolved to become more sculptural and texture based. Outsider: The idea of redrawing on the pattern remains in this cast white bronze table and chair. The lingering iconic drawings were first carved in and than carved out. One is meant to be drawn in by light flickering off the shiny texture as opposed to the signs and symbols." ArmChair, 1995, cast bronze; Denver Art Museum. Nymph Chairs, 1993, cast bronze chair; Brooklyn Museum of Art and Museum Of Fine Arts Houston. 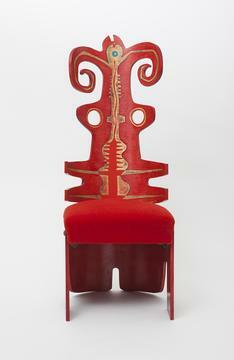 Fourth Frond, 1991,cast bronze chair and drawing; Ribbon Chaise, 1981 (Main + Main) - Metropolitan Museum Of Art, New York, NY. QueenAnneQueenAnne, 1980/93, enameled wood & mohair; Cranbrook Academy of Art Museum, Bloomfield Hills, MI. Flyer, 1990, cast bronze loveseat, Virginia Museum of Art, Richmond, VA.
Amity (from the Apparition series) 1989, cast bronze lamp; Indianapolis Museum of Art. 2002 Terra Incognita, Installation at 143 West 26th Street, New York, NY. 1997 Guerrillas, Art et Industrie, New York, NY. 1996 Terrestrial Tale, Art et Industrie, New York, NY. 1996 InfIorescence, Art et Industrie, New York, NY. 1990 Exhibition Evolution: from New York, Manufactory Gallery, Tokyo. 1989 Apparitions, Art et Industrie, New York, NY. 1988 Hellbenders, Art et Industrie, New York, NY. 1983 The Future Isn't What It Used To Be, International Design Conference, Aspen, CO.
1982 Third Stream, Main+Main, Art et Industrie, New York, NY. Urban Alligators, commissioned by Clodagh Design for The W Hotel, Fort Lauderdale, FL. Urban Guerrillas, commissioned by Clodagh Design for The Caledonia, Luxury Residential Building, New York, NY. Urban Guerrillas, cast stone sculptures, commissioned by Clodagh Design for Nemacolin Woodlands Resort and Spa, Farmington, PA. Cast stone Guerrillas and cast aluminium Frond Chairs, commissioned by Rockwell Group for the Rum Jungle, Mandalay Bay, Las Vegas, NV. The Palm Doors, private residence cast bronze entry doors, New York, NY. Untitled Dining Table and Nymph Chairs, carved glass and cast bronze, private residence, New York, NY. Falls Table, cast bronze, private residence, New York, NY. Felissimo Door, carved glass and cast bronze handle, commissioned by Clodagh Design, New York, NY. 2008 Design Miami/New York, Magen H Gallery, New York, NY. Art Basel, Switzerland, via Magen H Gallery. Design Miami/Basel, via Magen H Gallery, Miami Beach FL. London Design, Magen H Gallery, London Preview, Berkeley Square, London. 2007 Structure Et Surface, Harris Lieberman Gallery, New York, NY. International Exposition of Sculptural Objects & Functional Art, New York, NY. 2006 Design Miami/Basel, via Magen H Gallery, Miami Beach, FL. 2005 Modernism, 7th Regiment Armory, via Magen H Gallery, New York, NY. Design Miami/Basel, Magen H Gallery, Miami Preview, Miami Beach, FL. 2003 Significant Objects from the Modern Design Collection, Metropolitan Musem of Art, New York, NY. Group Exhibition, Rosenberg + Kaufman Fine Art, New York, NY. The Sculpted Seat, Leo Kaplan Modern, New York, NY. 2002 Magnet, Yassine Art Gallery, Dakar, Senegal. 2001 A Century of Design Part IV: 1975-2000, Metropolitan Musem of Art, New York, NY. 2000 Important Postwar and Contemporary Design, Icon20, New York, NY. 1999 Summer group show, Leo Kaplan Modern, New York, NY. 1998 Agitating Utopia, traveling exhibition sponsored by Cranbrook Academy of Art, Bloomfield Hills, MI. 1997 Get Out, John Elder Gallery, New York, NY. Form Function or Metaphor, Paint Creek Center for the Arts, Rochester, NY. Sit on this, The Chair as Art, PBCC Museum of Contemporary Art, Lake Worth, FL. 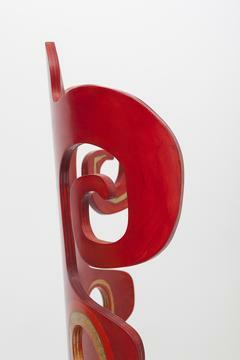 1996 Form Over Function, (from the collection of Sydney & Frances Lewis), Marsh Art Gallery, University of Richmond, Richmond, VA.
Young Curators Choose Chairs, Cranbrook Academy of Art Museum, Bloomfield Hills, MI. Eclectic Electric, Gallery Function Art, New Pontiac, MI. 1995 Building the Collection, Cranbrook Academy of Art Museum, Bloomfield Hills, MI. Back from Vacation, Art et Industrie, New York, NY. 1994 Modern Furniture, The Metropolitan Museum of Art, New York, NY. Art and Design for Living, Reidelbach Gallery, Troy, MI. 1993 Modern Metalwork, The Metropolitan Museum of Art, New York, NY. Art and Application, Turbulence, New York, NY. 1992 Lamp Edge, Leo Kaplan Modern, New York, NY. Mailbox Auction, Archives of American Art, Smithsonian Institution, Southfield, MI. 1991 Cranbrook Design: the new discourse, (traveling): Cranbrook Academy of Art Museum, Bloomfield Hills, MI. Allentown Art Museum, Allentown, PA, Yamagiwa Gallery, Minato-ku, Tokyo. The Chair: From Artifact to Object, Weatherspoon Gallery, Greensboro, NC. Functional Art, New York, (traveling) Brutus Gallery, Osaka, Japan, Kyodo Kikakum Fukuoka, Japan. Mondrian auf der Tube, Foundation for Constructivist and Concrete Art, Zurich. 1989 The Future Is Now, Bass Art Museum, Miami, FL. 1988 Magic in the Mind's Eye, Meadowbrook Art Gallery, Rochester, MI. 1987 Art in the Dark, City Without Walls, Newark, NJ. 1986 La Salon Ironique, Pompeii Gallery, New York, NY. 1984 Works on Paper, Pompeii Gallery, New York, NY. 1983 Ornamentalism, Huntington Museum, Austin, TX; Hudson River Museum, Yonkers, NY. International Design Conference, Aspen, CO.
1982 New York City Renaissance, Seibu Corporation, Tokyo, Japan. Terence Main, a remarkably boyish 48, merges sophisticated design credentials—he's a graduate of the prestigious Cranbrook Academy of Art and has two handcrafted chairs among The Metropolitan Museum of Art's collection—with a Huck Finn-like sensibility. "I grew up in Indiana. My grandfather had a farm, we had a creek, and I was into nature big-time," says Main, who moved to New York in 1978. But if his inspiration is earthly, his rendering is just the opposite. Incorporating natural motifs and organic shapes into works in bronze, wood, and glass, he transforms tables and doors into something magical. "He is a master craftsman," says Jane Adlin, an assistant curator at the Metropolitan, who displayed Main's cast-bronze Fourth Frond chair in the recent exhibit A Century of Design, Part IV. "When you hear 'craftsman,' you think of rustic people who live in huts, but Terence is not like that. He really intellectualizes what he's doing—it's not just decorative." Adlin says the museum shows Main's bronze chair more often than even those of Modernist legend Mies van der Rohe: "Mies says one thing; it's extremely important, but it's one thing. 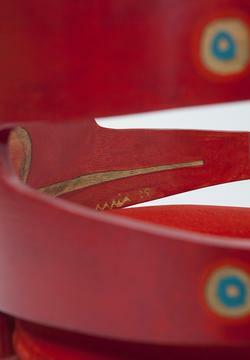 Main's work recalls organic design in the vein of earlier work in wood by Charles and Ray Eames and Alvar Aalto. Main speaks about craft and about craftsmanship as well as limited-edition design." Main's painstaking craftsmanship and his signature blend of art and design have also landed his work in some of the world's most urbane homes and offices. Interior designer Clodagh says she never has vodka at home "unless it's in a Terence Main glass." A table and set of chairs—whose vertebral spines look, admittedly, a touch uncomfortable—dominate the dining room of a Manhattan entrepreneur's SoHo duplex, as Main's Terrestrial Tale sculpture does the terrace. His doors, in bronze or glass and decorated with fanciful shapes, are arguably the most dramatic of his works. Main insists he was not inspired by any other doors—not even the famous ones by Pisano and Ghiberti for the Baptistery in Florence, to which they have nonetheless been compared. "I don't see myself in a tradition of anything," he says, "but I love it when people look at my work and talk about Florence or say it looks Indian or African or Aboriginal." Main's first doors, a set in tempered glass, were commissioned by Clodagh, who has known the artist since the 1980s, for an advertising agency in Tokyo. Ten feet tall, etched with forms suggesting mitochondria, and finished with bronze lintels and cast-bronze handles, they perfectly showcase Main's aesthetic. Making them involved covering the glass in rubber masking, cutting whimsical shapes from it with an X-Acto knife to create a stencil, and then sandblasting the exposed bits of glass to create the design. Another door Clodagh commissioned, in 1992, was for Manhattan's Felissimo department store. Using laser-cut stencils on glass, Main created forms that evoke swimming sea creatures. "There's something primeval about his work, like something submerged in time," says Clodagh. But Main's most spectacular project to date is the set of bronze doors at the entrance to a 7,000-square-foot penthouse on Manhattan's West 61st Street. Commissioned by the late art collector Michael Palm in 1995, the doors took nine months to complete. Palm's architect suggested making holes in them for a natural-lighting effect and worked with Main to ensure that the heavy doors functioned seamlessly. The result, a kind of gilded Rorschach test, is an essay in duality. "I wanted the outside to appear otherworldly and the inside very earthy," says Main. The exterior, facing the elevator, is patinated in marine blues and greens and decorated with spirals and patterns suggestive of stars and fossils. The interior, with a warm brown patina, reminds the apartment's current owner of "trees turning into a deer." She says her guests often spend long periods trying to decipher forms in the abstract composition. Sometimes, she says, they admire the doors to the exclusion of the works by Dubuffet, Matisse, and Di Chirico within the apartment. This extraordinary construction seems an apt expression of the essential Terence Main, a lifelong elider of distinctions between form and function who called one of his pieces—a riff on Charles Eames' famous lounge chair—My Eames Is True. "I'm really interested in the language of objects and their history," Main says. "It's not enough for me to just make something pretty."